Sarah Palin should be very thankful with the president and his administration this Thanksgiving - the administration is setting aside 187,000 square miles in Alaska as a "critical habitat" for polar bears. The total, which includes large areas of sea ice off the Alaska coast, is about 13,000 square miles, or 8.3 million acres, less than in a preliminary plan released last year. Tom Strickland, assistant secretary for fish, wildlife and parks at the Interior Department, said the designation would help polar bears stave off extinction, recognizing that the greatest threat is the melting of Arctic sea ice caused by climate change. "This critical habitat designation enables us to work with federal partners to ensure their actions within its boundaries do not harm polar bear populations," Strickland said. "We will continue to work toward comprehensive strategies for the long-term survival of this iconic species." Designation of critical habitat does not in itself block economic activity or other development, but requires federal officials to consider whether a proposed action would adversely affect the polar bear's habitat and interfere with its recovery. Nearly 95 percent of the designated habitat is sea ice in the Beaufort and Chukchi seas off Alaska's northern coast. 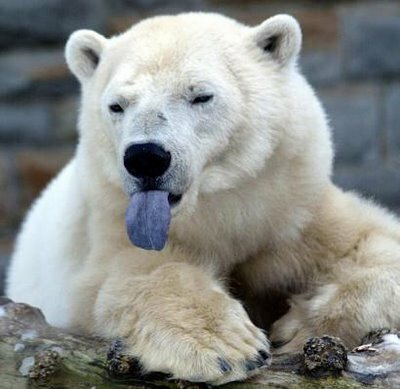 Polar bears spend most of their lives on frozen ocean where they hunt seals, breed and travel. Alaska Gov. Sean Parnell and the state's oil and gas industry had complained that the preliminary plan released last year was too large and dramatically underestimated the potential economic impact. The designation could result in hundreds of millions of dollars in lost economic activity and tax revenue, they said. While Palin would mostly likely attack the administration's move as being anti-states' rights and immediately damaging to the Alaskan economy, I thought the article points out something very interesting - the Obama administration compromised yet again. The original plan called for more. Alaska asked for less. The federal government compromised and designated less land as a critical habitat then originally called for. The only problem I have with this compromise is that the oil and gas industry complained that the preliminary plan involved too much land and would potentially negatively impact economic development - was there any immediate plans to grow business in the now designated areas? This would be like the federal government declaring parts of the Everglades in Florida a critical habitat and Floridian officials fighting back that doing so would hinder potential growth in the sugar industry - with the expiration of the Sugar Act at the end of 1974 and the elimination of production controls, the sugar industry expanded into sensitive ecosystems. While trying to reverse damage done by buying up land, the state has suffered some setbacks and United States Sugar will still be allowed to operate. 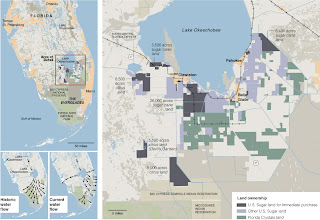 Imagine if the federal government declared the area surrounding Lake Okeechobee a critical habitat - would sugar growers claim potential damage to their business because it will be hard for them to expand in the future should they ever decide to, even though there are no signs of immediately doing so?